It is a translation of people’s statement on March 21, 2013. You can see the original Korean script, here. 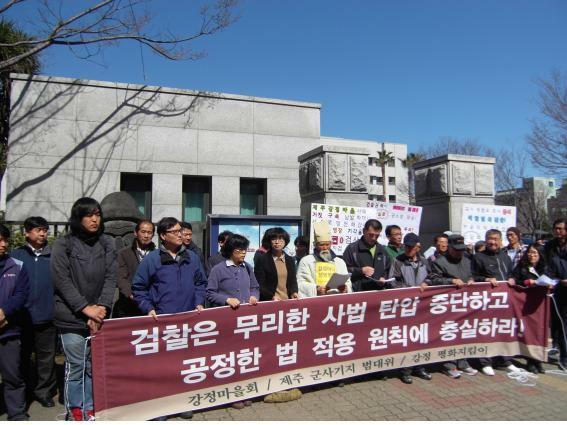 We denounce the prosecutors’ brutality to oppress the Gangjeong village! 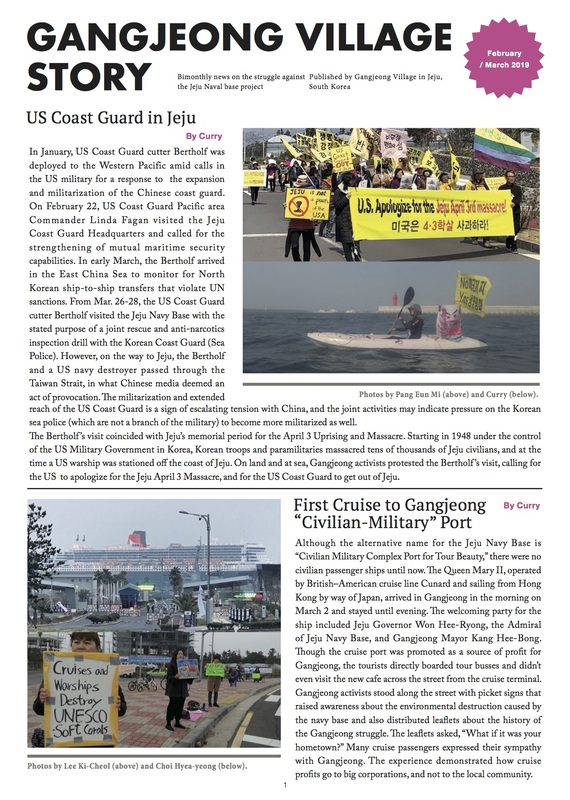 The navy’s illegal and law-evasive behaviors during the drive process for the Jeju naval base project have been exposed through the audit on the government affairs in 2012. While opposing against an illegal project is citizens’ natural rights and duties, the prosecutors, saying ‘it is a legal project with no problem,’ in their written arrangement, quibbled to strictly punish the citizens that have opposed the Jeju naval base project while giving an indulgence to the project interspersed with illegality and law-evasiveness. For example, in their arrest warrants on July 3, 2012 against Mr. Kim who was arrested for his crane sit-in in protest of ‘uninstalled silt-protectors,’ on June 30, 2012, they stipulated that “since double silt-protectors were completely installed, there is no possibility of floating materials in the vicinity sea. However there has been not once that double silt protectors have been installed in the Gangjeong Sea observed of the regulations in the environmental impact assessment. Moreover, on July 2, just one day before the arrest warrant against Kim, the Jeju Island governor, sending an official letter to the joint chief of naval operation, had directed him to “resume construction after carrying out restoration construction on silt protectors and then receiving the Island government inspection on it.” The fact that the prosecutors manipulated arrest warrants against Kim, ignoring navy’s such illegality but representing only the positions of the construction companies, shows the current status of the prosecutors. Such cases are not limited to one or two. It is not only in case of arrest warrants. The ‘written arrangements’ are also filled with various lies and distorted facts. The prosecutors defined a citizen who has not done even one-man protest in the Gangjeong field as ‘a professional protester,’ only to demand an imprisonment sentence against him. They have even forcibly indicted a peace activist in Gangjeong despite the proof of a photo that it was a construction company worker who kicked and damaged the construction fence. The prosecutors ‘cancelled indictment against the peace activist’ during the trial. There has been a case that the prosecutors have claimed 10 months imprisonment against a citizen but got the court decision of ‘no guilty on him/her. Not to mention it, a trial of a citizen who was charged for the violence against police ended because of the police violence shown in the screen submitted by the police themselves. The citizen filed later a written accusation against the police. To oppress religious events, the prosecutors over-issued mass indictments against the people who were sitting for the Catholic mass and prayer meetings in front of the gates. 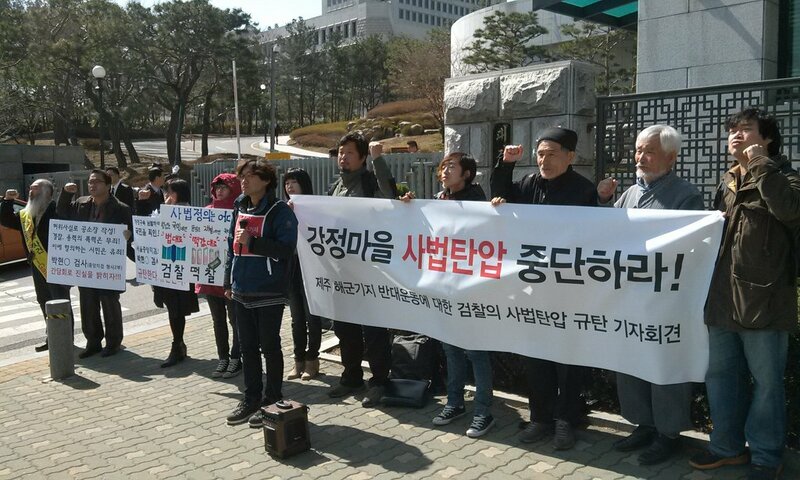 They have even demanded a sentence that is not stipulated in the ROK criminal law. The fact that is especially a problem is that such cold application of law is boundlessly benevolent on the violence by the police and construction companies. The representing examples are: The disposal on non-indictment of a cement mixer truck driver who wielded violence against a woman; a connivance on a police director of criminal investigation who took violence against Yang Yoon-Mo [on April 6, 2011]; a connivance on the navy who took violence against Dr. Song Kang-Ho [in June, 2011]. Because of that, the victims of four times police violence that resulted in their bones being broken have not even filed written accusations against the police. It is because it is obvious that it would result in wasting of paper to file to the Jeju Police and Prosecutor’s office with written accusations, regarding the police violence . The prosecutors dispose with ‘no guilty’ for the violence by construction company thugs and police even though there are proofs; indict citizens who protest to such violence by construction company thugs and police, only with the police testimony; but demand an imprisonment sentence against the citizens. Such behaviors of the prosecutors show the typical type of judicature violence. Tens of Asian Human Rights organizations who have visited Gangjeong in 2012 and UN Human Rights rapporteurs have expressed serious concern about the ‘state violence and human rights violations’ that occur in the Gangjeong village. The Jeju prosecutors should not forget that the subject that has brought in the international society’s concern is nothing but themselves. The prosecutors, abusing their judicature power, have afflicted the Gangjeong villagers and citizens who oppose the naval base project. Even though it is natural that they immediately release the citizens who took just resistance act or protested against police violence but whom the police arrested, the prosecutors used to release them fulfilling the legal limit of 48 hours or used to indict them based only on the police’s lie testimonies or slipshod interrogatory documents without concrete proofs and then used to over-issue unreasonable prosecutions and arrest warrants against them. While it is the responsibility of the judicature power to measure justice by collecting the claims by the anti-base side with even minimum principle of equity, the Jeju Prosecutors have not only condemned the accused with their subjective hostility and over-issued sexual discriminatory remarks, but also have prosecuted hundreds of imprisonment sentences based on partial value judgement that the citizens ‘should be strictly punished because they oppose the national project.” Further, considering that the case of actual prison sentence is only one (actual prison sentence rate is less than 1%) and there are many cases of no guilty sentence, it is clear how unreasonably the prosecutors have over-issued their judicature powers. Stop all the oppression of unreasonable wielding of judicature power against the citizens, by asserting that there should be no opposition to the Jeju naval base project interspersed with illegality and law-evasiveness! If such judicature oppression is to be continued, the prosecutors will face more tremendous citizens’ resistance than the current. Image source: Rev. 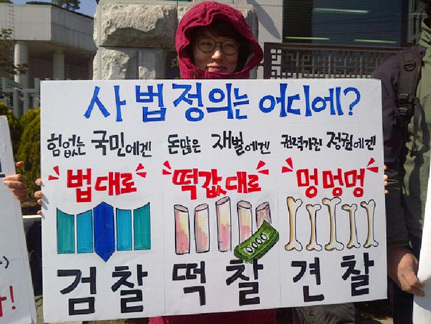 Jeong Yeon-Gil/ “Where is the judicature justice?/ The prosecutors do “by law” to the powerless citizens, but “by bribe” to the riches, and the police do “Like dog” to puppet government!